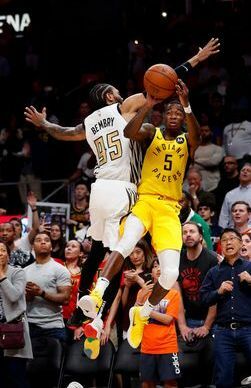 (ATLANTA) – Edmond Sumner sank three free throws with three-tenths of a second remaining, lifting the playoff-bound Indiana Pacers over the Atlanta Hawks 135-134 Wednesday night. Taurean Prince's 3-pointer with 1.1 seconds remaining gave Atlanta the lead, but DeAndre Bembry's foul on Sumner's last-second 3-point attempt changed the game. TJ Leaf set career highs with 28 points and 10 rebounds for Indiana. Tyreke Evans scored 27 points and Sumner had 22 as the Pacers won despite resting most of their top scorers. Prince and Trae Young each scored 23 points for Atlanta. John Collins scored 20 points and set a career high with 25 rebounds. With their fifth seed and matchup with fourth seed Boston already set in the Eastern Conference playoffs, the Pacers were in full look ahead mode. Coach Nate McMillan says Myles Turner (sore right ankle) should be ready for the playoffs.